A Long Island Rail Road third track might have prevented or lessened the impact of last weekend’s train derailment and other recent service disruptions along the railroad’s Main Line, supporters of the plan say. The third track along a 9.8-mile stretch between Floral Park and Hicksville would give the LIRR more capacity to run trains, MTA officials have said. 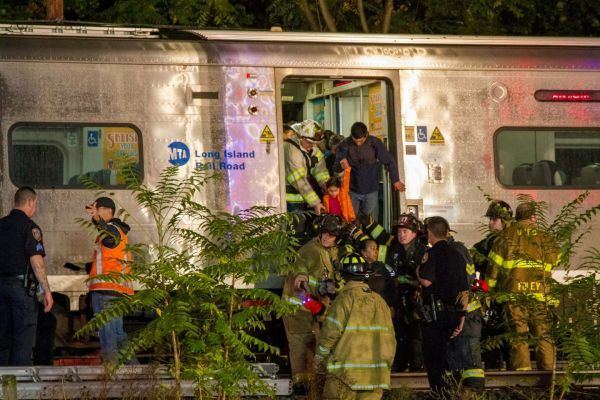 Although the LIRR’s capacity problems are not new, numerous incidents along the Main Line in recent months have added urgency to calls for the third track, which MTA officials have said would allow the LIRR to provide service when one or even two tracks are down. The derailment was the cause of just one of at least four major LIRR service disruptions to originate within a 3-mile stretch of track over the last week. Less than two hours after the LIRR announced it had restored full service after track damage from the derailment Monday afternoon, an unrelated switch problem in Mineola snarled the evening commute, canceling trains and causing delays of up to an hour. “If you had a third track now and had an incident involving two tracks, you could still be running trains,” Cuomo said. In January, Cuomo and the LIRR proposed building the third track to also give the LIRR the ability to bounce back from service problems. Project officials have said they plan to release an environmental study later this year and begin construction in 2017. The proposal resurrected a similar plan that was defeated by local opposition about a decade ago. Unlike the original proposal, the new third track would be constructed largely within the LIRR’s property and not require taking private property, project officials have said. Last week, an MTA spokesman likened the situation to the kind of traffic jams that occur when a car breaks down on one lane of a two-lane highway. Martins said a better comparison would be a two-lane highway riddled with potholes. MTA project officials said Tuesday the LIRR continually maintains its tracks, and noted that the work train involved in the derailment Saturday was doing just that. The project officials said that, more than just help recover from service disruptions, the proposed Main Line expansion project would prevent some incidents from occurring at all by eliminating seven grade crossings prone to accidents, involving vehicles and pedestrians. Kevin Law, co-chairman of the Right Track for Long Island Coalition, a consortium of supporters of the project, said Tuesday that although “you never like to see people get hurt in some of these incidents,” the potential for a third track to have helped in each circumstance is clear. Oct. 8. A derailment just west of Merillon Avenue Station near New Hyde Park stops service on both tracks, and as repairs are ongoing, only one-track service is in service during the Monday morning rush. Delays and cancellations affect westbound passengers and there is a complete shutdown for eastbound passengers. Oct. 5. A broken rail east of Mineola Station just before 6 a.m. halts service in both directions during the morning rush, causing delays and cancellations for thousands of passengers. Oct. 5. A truck strikes an LIRR bridge in Mineola, suspending rail traffic there for a half-hour. Aug. 19. A person is struck by a train at Mineola Station stopping service in both directions during the morning rush, triggering delays and cancellations for thousands of commuters. Aug. 19. A car strikes a crossing gate in Westbury that’s proposed to be eliminated in the Expansion Project, causing further delays for passengers. On Aug. 15. A person is struck at Westbury Station, halting service during the evening, and causing delays and cancellations for thousands of commuters. July 27. A person charged with drunken driving enters a grade crossing and strikes the third rail, putting the Main Line out of service during the morning rush, and causing delays and cancellations for thousands of passengers. July 20. A car strikes a crossing gate in New Hyde Park that’s proposed to be eliminated in the Expansion Project, causing delays for passengers during the morning rush.